The Focus of Pensacola omen's Home - Addiction and alcohol recovery center for adult women, located at 5304 Hurst Drive Columbus, GA 31904 (855) 934-4673 – addiction rehabs and rehabs near me. 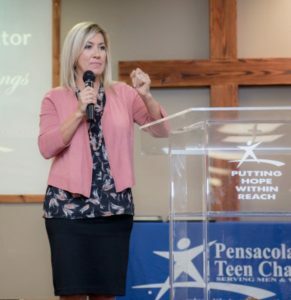 The Adult & Teen Challenge focus is on the total person with spiritual, emotional, physical, social and educational training to prepare them for their new life, post-addiction. Long-term residential recovery programs like Adult and Teen Challenge differ from typical short-term programs you hear so much about. Short-term “revolving door” programs are visited again and again by relapsed addicts, temporarily solving the addiction, but never solving the core of the problem so the addiction comes right back again. So, the addict has to return to rehabs, again and again, costing them, their insurance carrier, or their family tens of thousands of dollars each time. Every day, Adult and Teen Challenge centers enroll individuals who have previously attended 5, 10, 20 or even 30 costly short-term rehabs, to no avail. They should have come to Adult and Teen Challenge first! So, why is Adult and Teen Challenge different? It is one of few programs that will dedicate a whole year to work with each addict. That is a huge financial commitment by the organization and community, but it is time needed in order for the recovery rates to be what they are. The day-to-day structure, community, and faith emphasis over such an extended period of time bring addicts slowly out of wrong and drug-impacted thinking into an awareness of a purpose for their life and a new way of thinking and living. Such a new purpose and way of living is one that has no place for abusing drugs or alcohol; addiction is replaced by self-love, peace, happiness, purpose and an excitement for the future.